This December marks the 25th Anniversary of Gingerbread Wonderland. Guests, young and old, marvel at the creativity, skill and sense of optimism that characterizes this charming and ecumenical exhibit of hundreds of edible structures. Vote for your personal favorite in The People’s Choice Award, sponsored by Shop Rite of Morristown. An award will be given to the first place winners in each of the six categories: Adult, Family, Children, School, Scout and Special Needs. $2 per person (at door), children under 2 FREE. We are no longer taking applications for Gingerbread Exhibitors, but here are the rules and recipes for use by those who have already applied. Need a starting point for your creation? 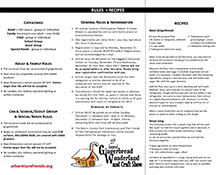 Click the image at left for recipes for basic gingerbread plus the gorilla-glue of gingerbread, Royal Icing.